The US EPA estimates that there are over 100 million exit signs in use throughout the United States alone. The number is growing every day. When safety-proofing your property, the best way to go about it is to take the easiest route possible. In doing so, you’ll save money, time and headaches. You can also rest assured the work has been done correctly. There are 2 popular options many business owners and facility managers choose for emergency lighting. These are edge-lit exit signs and LED exit signs. Edge-lit exit signs are the ideal choice if you want a high-quality sign that also blends with your building’s décor. Edge-lit signs meet the rigid specifications most authoritative bodies require, while featuring soft finishes and rounded corners; making them the ideal choice for high-end corporate offices and buildings. 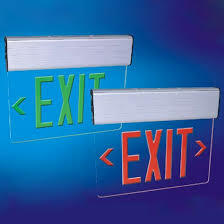 LED, (light emitting diode) exit signs are the other popular choice. One important reason is because many businesses and facilities need to have more than 5 or 10 exit signs. Some buildings need as many as 20, 50 or 100. Because of this, exit signs consume a lot of energy. LED signs, (though not always the most stylish), can help to cut back on that energy bill and lower your energy costs. LED exit signs are also high-quality. They are rugged, bright and consistent. They also work well in hallways that tend to be smoky or dim. In addition, maintenance doesn’t end with inspections. Call us anytime to fix any problem or to replace any non-working parts. Contact us today at Lighting Services Inc. to simplify your egress lighting solutions and safety protocol. You have enough to worry about.